The Lagos State Police Command has ordered the arrest and detention of the inspector that arrested and detained a woman for recording him assaulting commuters in Lagos. In a statement signed by the Police Public Relations Officer, SP Chike Oti, the commissioner directed that the inspector should be arrested. The matter has been transfered to the Provost Department for further investigation. 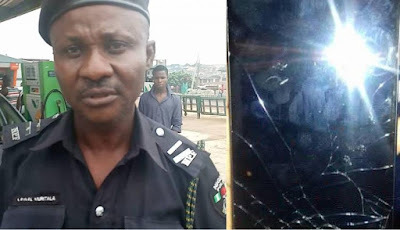 He said, “The attention of the Commissioner of Police Lagos State Command has been drawn to a posting in the social media alleging that a police inspector serving in Lagos State Command, slapped a young woman during an argument inside a commercial bus that commuted them from Obalende to Dopemu, along Agege Motor Road, Lagos. “In view of the above, the CP Lagos had directed the Divisional Police Officer in charge of Dopemu, CSP Mary Ayim to arrest the Inspector, get the facts of the case and transfer the matter to the Police Provost Department for further investigation. The Inspector, one Lawal Murtala, had slapped the woman and damaged her mobile phone for allegedly committing the offence of video recording an officer. According to the lady, Anne Bibi, who posted the incident on both her Instagram and Facebook pages, Murtala of the Dopemu Division, Lagos, seized her phone and detained her for hours. She further alleged that Murtala forcefully deleted the pictures and videos on her phone before damaging the screen, adding that the Inspector said videoing a police officer is a crime. However, unknown to the Inspector, the lady had sent the videos and pictures to her sister through a messaging app, WhatsApp.